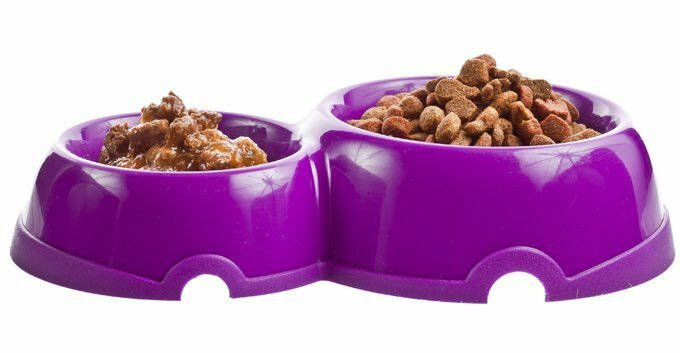 Is it better to feed my cat wet food or dry food? Cats are carnivores and require a diet high in animal protein. They are not designed to utilize carbohydrates (grains, sugars, starches) efficiently. A diet high in carbohydrates encourages fat storage, since protein is utilized primarily for energy. Dry diets contain a higher amount of carbohydrates than wet foods. This also leads to an increase of excess calories to the felines as many cats are fed dry food ad lib (free choice feeding, i.e., keeping the food bowl filled at all times). Cats have evolved to get most of their water intake from what they eat. By incorporating wet food into your cat’s diet, the overall water consumption is increased, which is vital to the well being of kidney and bladder function. Feeding a diet with higher protein and lower carbohydrates has also been shown to better control hunger sensations, so a cat can control their weight more efficiently.